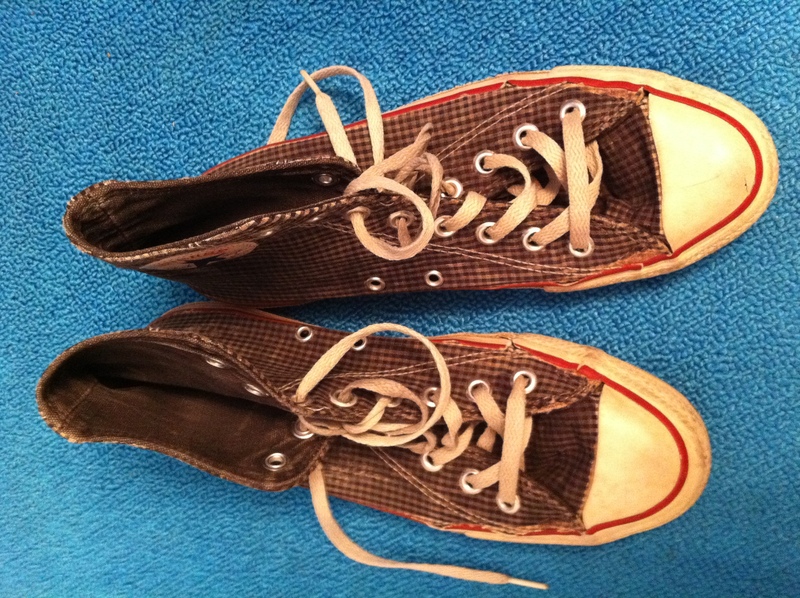 When I was 9 or 10 I got the idea in my head that I wanted a pair of plaid Converse high tops. Believe it or not, they weren’t such an easy thing to find back then. I mean, nowadays you can get all sorts of crazy prints, colors and styles, but at the time it was the mid-’80s, and I wanted a pretty specific color scheme — dark blue and turquoise plaid. I was a very particular 5th grader. I searched for ages but couldn’t find what I was looking for, and finally settled for a classic pair of bubblegum pink ones (whether you are a guy or a girl, 10 years old or 50, you cannot go wrong with pink Converse). I went to visit my friend Ryan in L.A. the summer after my first year of university, and in the midst of a particularly late night drinking session I inexplicably decided it would be a good idea to color them in black with a magic marker. I regretted this move the next morning, but luckily the black wore off some and you can still see the checkered pattern underneath. I have been wearing them for 20 years and they are still one of the best pairs of shoes I’ve ever had. 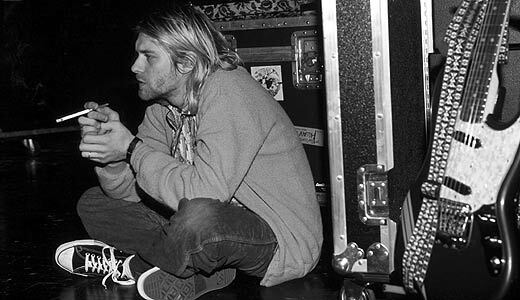 Not surprisingly, I love it when dudes wear Converse. It’s just such a great look. Gets me every time. To this day I have still never stumbled upon a pair that are dark blue and turquoise plaid, but I’ve always got my eyes open. I am confident they will find their way into my life someday. This entry was posted on Friday, January 20th, 2012 at 12:40 pm	and tagged with rock star style and posted in Spotlight on Style. You can follow any responses to this entry through the RSS 2.0 feed. Converse Weapons were my kicks of choice when I was a young baller, but my wife’s been obsessed with Chuck’s since 2006 when we visited Buenos Aires and ALL the beautiful people were sporting them. A classic style for classy kids. 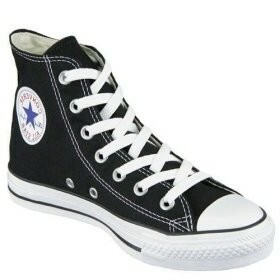 Yeah, pretty much everyone looks good in Chuck Taylors. They are super versatile. You can wear ’em with jeans, or with a suit. Or a dress. So amazing. Love them. “A classic style for classy kids” — well said, my friend. I always used to where the cream low cuts. Except for a brief period in the late 80’s when I had a pair of pink low cuts, seemed right at the time. Now I am partial to the leather bleached white high cut- more support and a little more water proof. My first pair of Chucks was a pair of Pink Low Cuts, I picked them up for $10 in a clearance rack in 1990. At the time I was working at a hospital with guys who had severe brain injuries and severe behaviour problems. I wore them every day, then found another pair for $5 in a clearance rack. All my co-workers were jealous. Had a few other pairs, blue and cream over the years but can’t wear them anymore, they wreck my feet, and I am not going to sacrifice for fashion so back to Doc’s. Dude!! I totally feel for you! I can’t believe you can’t wear them anymore 😦 But Doc’s are a pretty stylish alternative, so at least you can rock those!